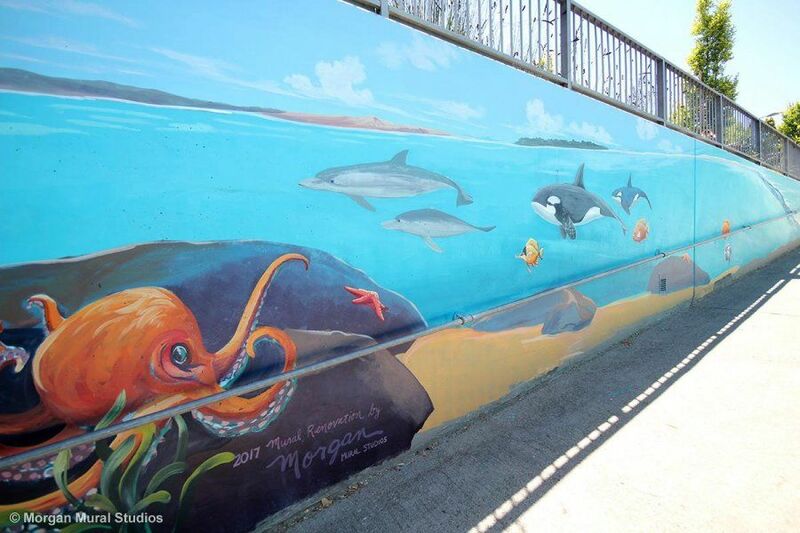 Never underestimate how attached a community can become to a mural. 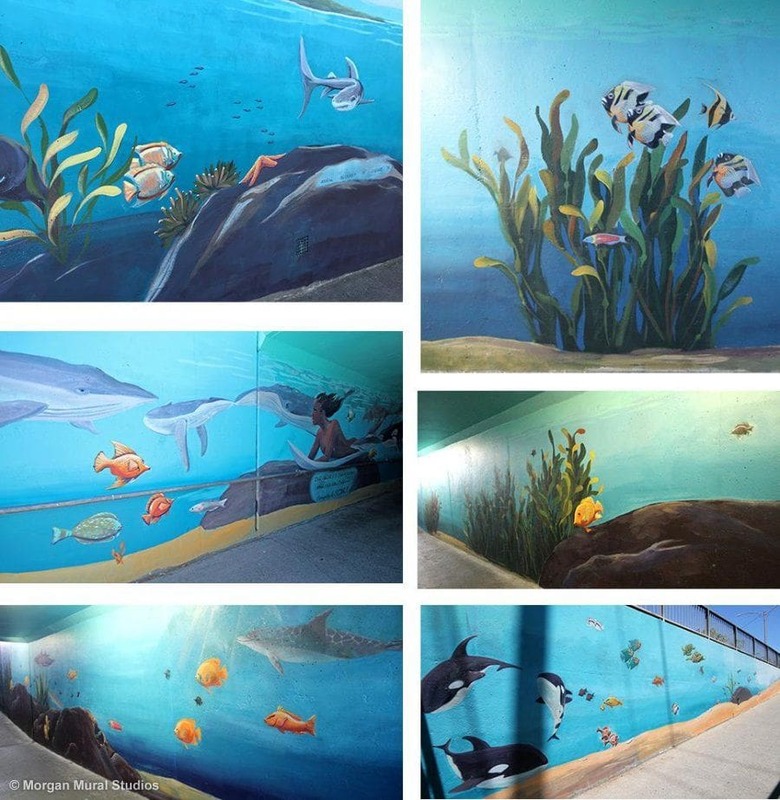 I learned this first hand while renovating the underwater mural at the California Pedestrian Underpass at the end of California Avenue in Palo Alto. It is a heavily used underpass. Throughout my days painting there, I heard a steady stream of comments that revealed how attached the community was to this particular mural. People would stop to point out their favorite fish, or want to share with me their fond memories of watching the original mural go up. Most commonly, people stopped just to make sure that I am only touching it up, right? Faded paint was peeling off the wall. The tunnel walls were starting to make the tunnel feel more scary, not less. It was attracting taggers and vandalism. The underpass had fallen into disrepair, and it reflected badly on city maintenance. Figuring out how to remedy the situation was more complicated than you might expect. 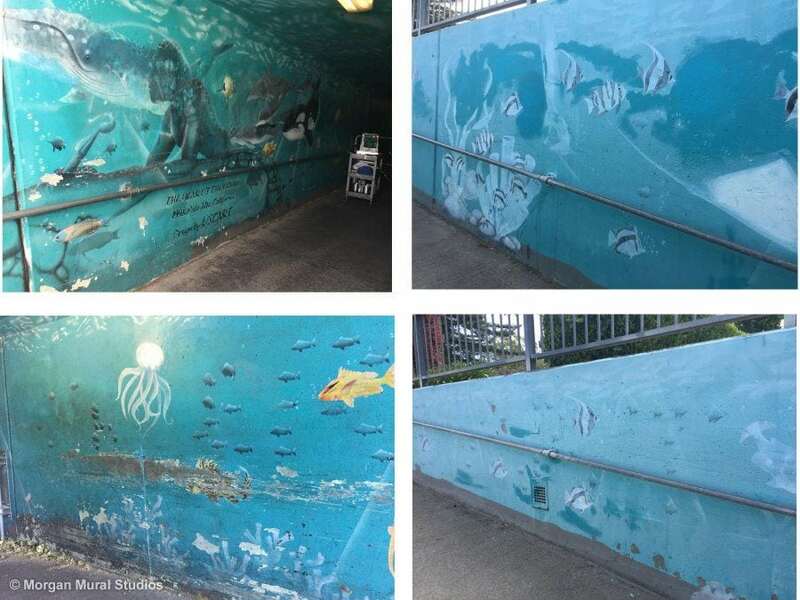 This heavily used pedestrian underpass has structural issues that cause water to seep into the walls, but there were no funds available for the substantial public works project that would be required to remediate the issue through the City or Caltrain.The ocean themed mural was originally created as a community art project painted by volunteers, and the artwork itself was not consistently of professional quality. Because of the water seepage issues and quality of the original artwork, it did not make sense to invest in a complete restoration of the mural. The city was in a pickle: how to patch up the current art so it can last just another five or ten years until a long term solution is decided? There were no easy solutions. I worked closely with Elise DeMarzo and Nadya Chuprina, who do an incredible job running the city’s public art program, and they trusted me to “do the best I could” with some of the inherent challenges of a touch-up project. Our aim was to get rid of all the cobwebs, grime, and the worst of the peeling paint, as well as brighten up the colors on the fish. My intention was to preserve the original spirit of the mural, while adding my own creative flavor and details that would improve the trip through the tunnel. It’s hard for me to go halfway into the pool. I ended up covering every square inch of the wall tunnel – 3500 square feet of sea life – in the seven days budgeted for the project. After the mess of the scraping, it was a marathon of rolling on vibrant blues and painting portraits of aquatic life. I loved being a block from my favorite paint store on the peninsula, California Paint. They even provided onsite deliveries for me. The tunnel is a major artery for Caltrain commuters, kids going to and from the middle school, and as a link from the residential to comercial side of midtown Palo Alto. I was struck by how upbeat the energy of the commuters were. From day one, and every day I was onsite, it surprised me. Maybe it was just the coffee in the crowd, but I think there is a unique energy to people who use their feet or bike instead of cars for their commute. I was even included in bike to work day festivities where volunteers tallied about 900 people that had gone through that tunnel in a four-hour time span. I tallied that about 890 of them seemed cheerful. Maybe it was the free pancakes and coffee at the event. When I came back for my last day of touch-ups, a woman came up to me and told me that the mural had been a point of family discussion each night at their dinner table, what had changed, what was new, etc.. She said that her eight-year-old son had ventured that it was unfortunate that I couldn’t paint the ground as well. I happened to record this conversation. You can listen to the request from this passerby and see how I integrate her son’s idea on the fly into what I had planned for the day. I painted about fifty ground elements, including starfish, seashells and sand dollars. I included a caution to bikers that might have been written in the sand with a stick: Walk your Bike. 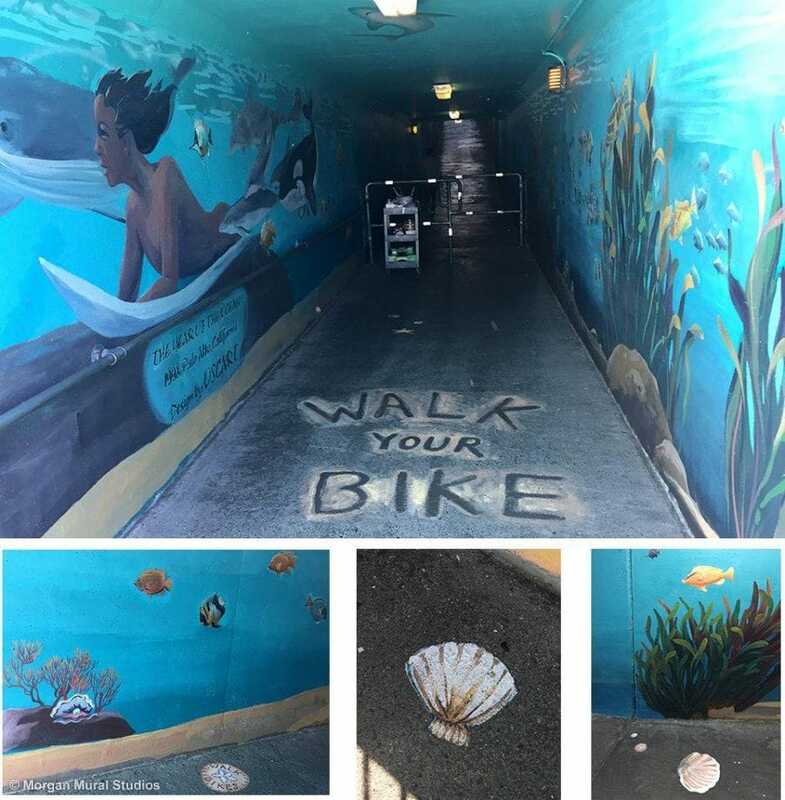 I invite you to take a field trip and go walk the renovated California pedestrian underpass in Palo Alto. Count the starfish with a child. Pick out a favorite fish. Let me know if you don’t hear the roar of the ocean just a little bit as the crowds of happy commuters pass you by.